I know that I previously reported that our Anti-Bunny/Tumbleweed gate was completed, and it was functional. But I still had some cosmetic details to work out, and I wasn't sure when I would get to them, or how successful I'd be, so I didn't say anything at the time. 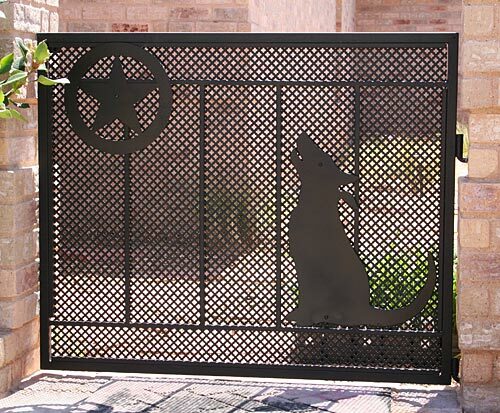 The little coyote was created by my brother years ago and it was hanging on a different gate at our old house. I wasn't sure I could "re-purpose" it for this gate because of the mounting mechanisms, but the carbide cutter on the trusty Dremel tool solved that problem. Eric, that's pretty neat looking. Thanks. I had fun building it, but there were times when I wasn't sure I'd ever get finished with it. This page contains a single entry by Eric published on April 5, 2010 2:29 PM. Overdue A/V Upgrade was the previous entry in this blog. Mockingbird Recording is the next entry in this blog.